Price includes 1st class postage. 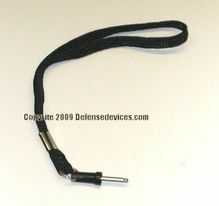 This is the lanyard and pin that allows the Streetwise or Stun Master Runt stun guns to function and disables function when withdrawn from the unit. These are the same parts that originally are shipped with the stun gun or baton. Sometimes called a wrist strap. EDP2: For ALL Streetwise and JOLT stun gun models that require a disabling pin, except the SWB5000R. This item is for a single disable pin. See dropdown menu for choices. Cheetah makes different sizes for their lipstick stun device vs their other stun gun (boxy shaped or pen) models.